The All-Star break brings a chance to reflect on what’s happened so far this season. For me, that means going back to examine a series of offseason pieces on various players. It’s fun to see what I might have been right or wrong about. Set up on at a different position on the rubber. Wrangle additional spin he gained from 2015 on all pitches, which could feed into sequencing. Where a pitcher sets up on the rubber is one of those things that seems so utterly simple that it might not even feel like a real suggestion. But the change does do something fundamentally critical, which is influence the path of the baseball to the plate. These images come with a caveat: Milwaukee’s camera angle at home was different last year. I had to find one that looked as straight-on as possible, which was a game against the Cardinals in St. Louis. 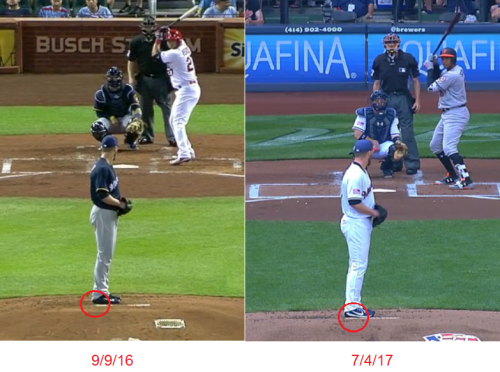 That said, it appears as though Nelson has moved his back foot in to meet the edge of the rubber this year, whereas it hung off a bit in 2016. The difference seems to border on negligible and just enough to matter. Being more centered can help throwing toward the middle of the plate and letting the spin on each pitch speak for the movement. Jeff Sullivan broke down Nelson’s full motion, though, and found that, regardless of setup on the rubber, he’s driving more directly to the plate. That aids the ball’s path, too — maybe even more — and still contributes to letting the spin on his offerings do the talking rather than trying to command a part of the zone every time. Like Sullivan, The Sleeper and the Bust posited that Nelson has embraced something new. Paul and Eno focused on his arm angle on his slider, enabling two-plane break that distinguishes it from his curveball. Feeding into the arm angle would be a different grip that accommodates it. The uptick in slider spin would seem to back all that up. In 2017, Nelson’s added 124 revolutions to it. (Dang!) The truly fascinating detail here is just how little the arm slot and grip changes might be to provide that kind of jump. Driveline Baseball has detailed how spin could be put on a ball in 6 milliseconds. For perspective, consider that a baseball generally reaches the plate in 40 milliseconds, or four-tenths of a second. The way it moves is determined more than six times as fast. 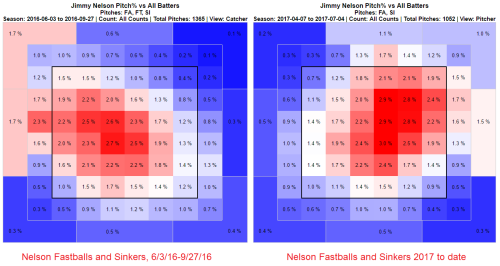 The new break on Nelson’s slider may also better facilitate fastball use this year. Last year, his heat started leaking over the heart of the plate as the season wore on. Sullivan noted how Nelson’s change in motion this season has seen him throw less across his body. By being more direct now he can more readily attack up and down in the zone. Combined with how his new slider bites to the glove side, his mechanics allow his strongest pitch to augment his ability to sequence. Nelson’s performance isn’t the only reason this is all relevant. After his final start of a miserable 2016, he told reporters that “I know that [pitching coach Derek Johnson] and I are doing the right things.” In the winter I said that may have been true, but that he might not have put it all together optimally. Sometimes that work can take time to make an impact. His 2017 is a testament to the split-second nature of baseball, and how blinking at the wrong time means you might miss something big. Nelson was close to becoming an afterthought. Now he’s a major reason Milwaukee sits atop the NL Central halfway through the year. We hoped you liked reading Following Up on Jimmy Nelson by Tim Jackson! A question on the spin rate increase for the slider. Is that statistically significant? What’s the standard deviation look like on pitches from year to year? I’m a Brewers fan, so you caught my eye with the Jimmy article, but I’d be curious to know if the slider spin is real improvement or typical variation. Thanks for the read. Ah, gee! Thanks. Middle School Tim is shaking his head at not catching that before submitting.